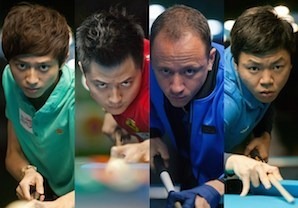 Ko Ping Chung (TPE), Ko Pin Yi (TPE), Shane Van Boening (USA) and Wu Jia Qing reach the final four at the 2015 World 9-ball Championship. 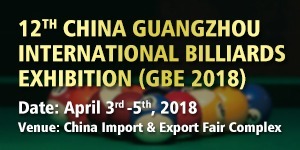 (Doha, Qatar)–If you like your pool served up on a golden platter, with the very best in the sport battling it out for the ultimate prize, count yourself lucky because the 2015 World 9-ball Championship just delivered the goods. With literally everything riding on the line at the Al Arabi Sports Club in Doha, four of the sport’s premiere players braved a marathon day of pool, fought their way through a minefield, and emerged into a final four on Friday that is about as rock solid as it gets in pool. 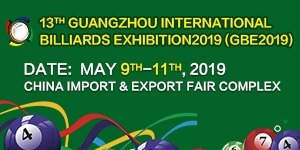 In one semi-final Ko Pin Yi of Taiwan will take on former World 9-ball champion Wu Jia Qing of China. 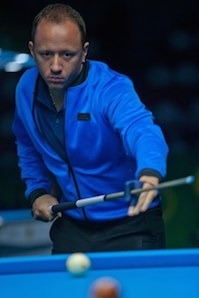 In the other semi-final, Ko’s younger brother Ping Chung will match wits with the USA’s Shane Van Boening. Both race to 11 semi-finals will be played simultaneously beginning at 1:30pm in Doha(GMT +3). The race to 13 final will begin at 5pm. The story lines and possibilities of these two matchups, and the possible finals pairings,–especially with the very real chance of having two brothers face each other for the world crown– have fans around the world lighting up social media with excitement. Wu, who was born and raised in Taiwan before moving to China in his early 20’s is the ex- wonder boy who, ten years ago, won the World 9-ball Championship at the age of just 16 years old. Ko, also 26 years old, was a child pool prodigy himself who finally captured his first world crown in February in the Philippines when he won the World 10-ball Championship. This is a matchup that fans have waited years to see. As prodigious as Ko is, his younger brother Pin Chung is said by some to be even better, if that were even possible. The 19 year old Pin Chung, who will be celebrating his 20th birthday on Friday, has played brilliantly all week, and is seemingly impervious to pressure. 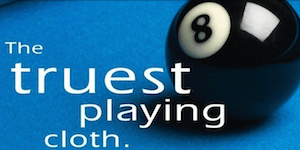 For his part Van Boening comes in playing the best pool of his career, and the man who carries the hopes of the USA firmly on his shoulders has an air of destiny swirling all around him. The American versus the young Taiwanese is a true clash of titans. With their stellar play today, and throughout the tournament, it’s nearly impossible to choose among the four who would be a favorite to lift the trophy on Friday evening. But based on his level of competition today, and his overall rock solid play and demeanor, Ko Pin Yi, the older brother, might just get a slight nod from the bookmakers. As the round of 32 began today at the Al Arabi, Ko first squared off in a true marquee match with the Philippines’ Carlo Biado. These two met in the finals of the World 10-ball seven months earlier with Ko squeaking past the Filipino at the wire. Biado was a serioius top ten favorite here in Doha but against Ko the match wasn’t even close. 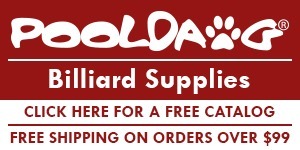 Ko was up 7-0 before Biado could get his cue unpacked and won in a rout, 11-4. In his round of 16 match against the Philippines Warren Kiamco, Ko allowed the Filipino to get close late, but crossed the line when it counted, 11-9. In the semi-finals Ko was paired with rising Canadian John Morra. 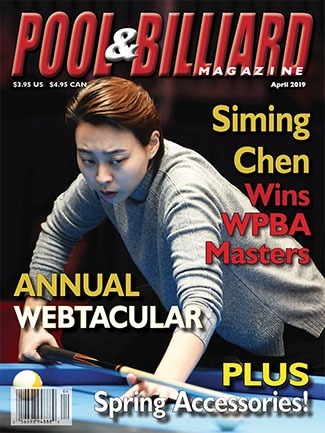 Morra had been playing marvelous pool all week and with some recent high finishes around the world, the Toronto native had the look of a man who could take his first title. Proof of this came in the round of 32 when Morra came back from 10-8 down against England’s Mark Gray to win 11-10. Then in the final 16 Morra stormed back from 8-4 down to bury Mika Immonen, 11-8. Ko and Morra stayed even in the first half of the match, which looked like it was going to the wire. But Ko again turned on the afterburners and won seemingly with ease, 11-6, to grab his semis spot. As usual Wu put in a brilliantly steady and workman like performance on his road to the final four. 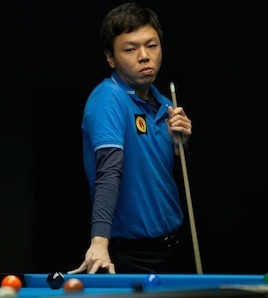 Employing his solid left handed stroke and masterful cue ball control, the Taiwan native first shut down last year’s runner up Albin Ouschan, 11-6. In the final 16 Wu battled back and forth with up and coming Chinese player Wang Can, before winning 11-9. In the quarter finals Wu matched up with Singapore’s 19 year old Aloisius Yapp, who had played his way into being one of the surprises of the tournament. In the round of 32 Yapp, the current World Junior champion, had no issues with the Philippines’ Jeffrey Ingacio, winning 11-6. Yapp then barely got by another great young player, Greece’s Alexander Kazakis, 11-10. Yapp admitted before his match with Wu that the Taiwanese was his pool idol. And the two had played numerous times over the years but Yapp had never won. And today was not the day that streak would change. The two stayed even in the first half of the match before Wu proved he had too much class, winning 11-7. With his baby face and rail thin figure, the younger Ko could easily be mistaken for a shy school boy who couldn’t hurt a fly. On the pool table, however, Ko displays a fierceness that is practically unshakeable. Japan’s Yukio Akagariyama learned this as he went out to Ko in the round of 32, 11-9. In the round of 16 the USA’s Mike Dechaine gave Ko a handful and very nearly took the match to a one rack decider. But when Dechaine missed a straight in 9-ball down 10-9, Ko had a spot in the quarterfinals. There he met up with surprise entry Wojciech Szewczyk of Poland. Szewczyk seemed exhausted from his previous two grinds and couldn’t keep up with the more talented Ko. The Taiwanese won easily, 11-5. 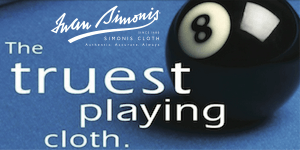 Ko’s semi-final against Van Boening has the makings of a classic. For while Ko offers a solid and steady immovable object, the American is clearly playing the best pool of his career. Van Boeing’s three matches today were veritable clinics in 9-ball pool as he dismantled a solid wall of talent, breaking perfectly and clearing tables with ease. In the round of 32, the American first buried Spain’s Francisco Diaz Pizarro, 11-5. In the round of 16, Van Boening made short work of Taiwan’s Chang Yu Lung, beating the recently former world number 1, 11-4. Van Boening then headed to the TV table for what fans thought would be a showdown with the Philippines Dennis Orcollo. But Shane kept breaking and running, while Orcollo couldn’t find an opening. Van Boening thumped the Filipino, 11-1. 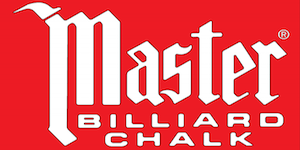 The win over Orcollo capped a breathtaking day for Van Boening, who’s looking to restore American pride to pool by becoming the first American player since Earl Strickland 13 years ago to win the World 9-ball Championship. A buoyant Van Boening is sure he has just the right formula to pull off his greatest ever triumph on Friday.